I would like to share our Proof of Concept solution for B2B that we built for Magento and other B2B eCommerce platforms. While working on eCommerce for B2B Clients, we saw that these companies still struggle with Omnichannel. 60% of B2B companies say that their buyers spend more when interacting with multiple channels. Omnichannel B2B customers are also more likely to become repeat and long‐term customers. One of the most popular buying channels is, of course, e-mail. Many clients just prefer to write an e-mail to order something, ask for a better offer or change something in the order. Sales Reps should use CRM tools to record all this data. The problem is that Sales Reps just hate to waste time filling in CRM systems. This means that some data is missing in CRM programs, or the majority of them are outdated, etc. This makes it impossible to serve clients well in other channels. So our idea is to use natural language processing and machine learning to automatically capture all data directly from e-mails and upload them to the Client Account in Magento. Our solution — Oxi, will automatically find and save all company names, clients’ details, offers sent, etc. Everything is captured from all Sales Reps’ accounts and merged under one-client account in Magento. Below you can see a Client Magento Account filled with data from email correspondence. to see what is going on in all channels. to easily find clients with an increase/decrease in communication/sentiment. So, for example, you can find clients/deals at risk. to see how every Sales Rep is performing — real-time, objective, always comprehensive data. to see trends in the sales process — for example, which offers are the most popular, which offers generate positive/negative feedback. This also allows Clients to see every offer and file that they have received from the company in their eCommerce client account. The same will be visible to Customer Support Consultants. So basically, you are able to create a 360-degree view of your customers under one Magento Client Account. We have gone further and we have built a simple console for all data we can capture automatically from emails. You can compare these data between sales and between time periods to get an overview of your sales team performance. Let’s move to the Account View — here you’ll find all new and existing clients we have contacted. All these data are automatically captured from emails so Sales Managers don’t have to manually enter any data. They can still add comments, tags, etc. In the future, we will auto-tag accounts based on natural language processing. For example, for each account you can see who is involved in communication from both sides and which files were sent. Here you can see for which accounts more than one sales manager is involved. This could help you gather knowledge about the client from around the company. This client is now served by Alex but Matt was talking with them before so maybe Alex should contact Matt and ask how was that going. In the future, we will add here more insights — for example, who is waiting for our response, whom should we contact again, etc. And the last functionality here is Topics. Here you can see a topic we created for various technologies that could be sold to a client. Thanks to that, we know how many discussions for each technology we really have. We also added topics related to various stages of a sales lead — so we know for each week and each sales manager how many times things like NDA or agreement were discussed. This could give you an overall but very objective overview of your sales processes. We use a collection of open source databases to drive the data layer: MariaDB, ElasticSearch, RabbitMQ and powerful REST API built on top of Symfony 3 to simplify integrations with external systems. To start with, we have integrated with Google Apps and with Magento 2.2. 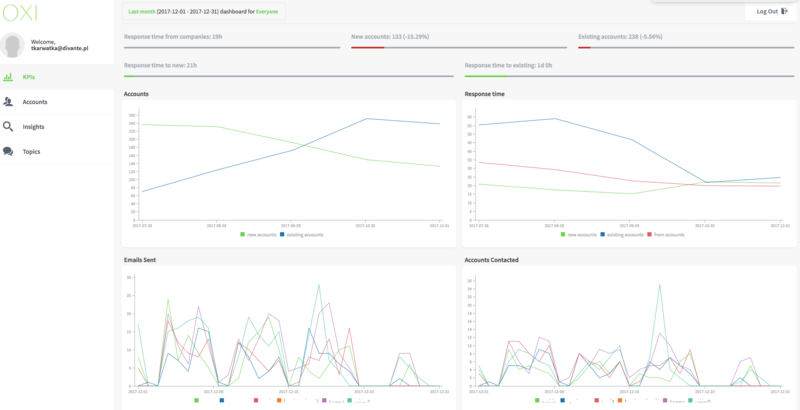 We built a message processing modeled as a manageable pipeline — this allows administrators to adapt new features easily. Then we built our very own algorithms to clean-up and analyze messages. We also use React.js for the web app. The solution is easily scalable due to a service-oriented architecture and Docker. 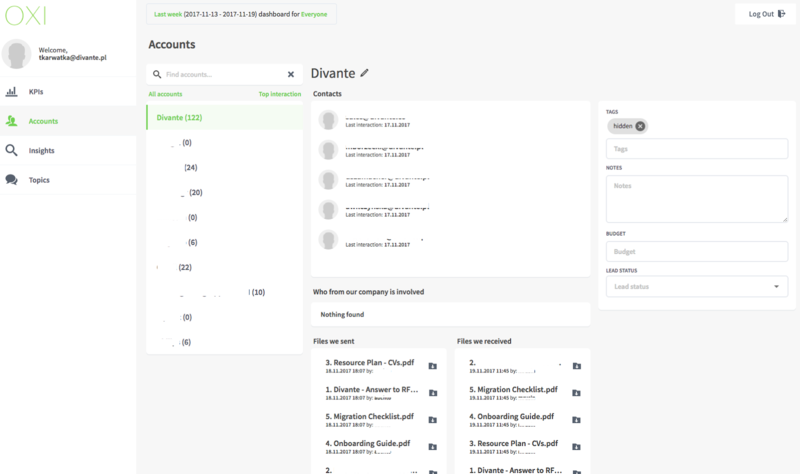 We have been using Oxi in Divante.co for tracking all our sales activities for several months. We also prepared a full integration between Oxi and Magento, and we are looking for retailers eager to test it. We can use the same approach to analyze: customer tickets inside Magento, customers’ comments in Orders, chat conversations, and even customers’ phone conversations and teleconferences (first speech2text and then we can treat the content as a message). We see we can successfully use AI-powered tools to fill the gap between more digital (eCommerce) and more human-driven (eMail, call-center) channels. If you would like to discuss PoC like this one, or use our PoC for your project, feel free to contact us. → To hear from me in the future, subscribe to my monthly newsletter (by Revue).